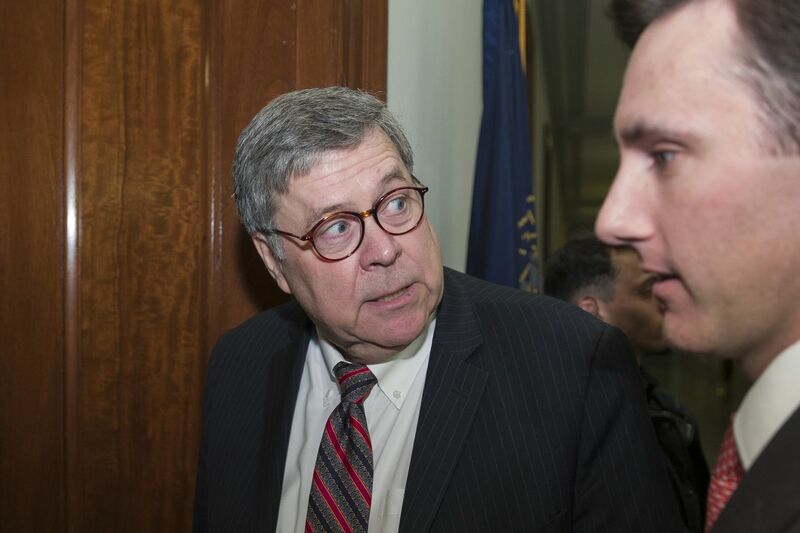 Attorney General nominee William Barr, left, turns to answer a reporter's question as he arrives to meet with Sen. Ben Sasse, R-Neb., on Capitol Hill, Wednesday, Jan. 9, 2019 in Washington. WASHINGTON - Top Senate Republicans emerged Wednesday from meetings with attorney general nominee William Barr insisting that if confirmed, he would not hinder Robert Mueller III's investigation of the Trump campaign's Russia ties, despite previous statements blasting the probe for looking into whether President Donald Trump attempted to obstruct justice. "Based on what I heard, he has a high opinion of Mr. Mueller, believes Mr. Mueller is doing a professional job, will do a professional job and be fair to the president and the country as a whole," Senate Judiciary Committee Chairman Lindsey Graham, R-S.C., told reporters, adding that Barr sees "no reason for Mr. Mueller to stop doing his job and is committed to allowing Mr. Mueller to finish." Graham is one of four Republican senators with whom Barr met on Wednesday, as he prepares for a two-part confirmation hearing before the Senate Judiciary Committee next Tuesday and Wednesday. Sen. John Cornyn, R-Texas, one of the senators who met with Barr on Wednesday afternoon, emerged citing similar confidence that the nominee would be largely hands-off when it came to Mueller's probe. "William P. Barr is what I would call a judicial law-and-order attorney general. He's not a politician," Cornyn told reporters. "He respects [Mueller], and I think he's on record saying he thinks he should be allowed to complete his work. To me, that's the long and short of it." But Barr's previous public statements about the Mueller probe have become a sticking point for Senate Democrats, who question whether he will be truly impartial in overseeing the investigation. Chief among Democratic lawmakers' concerns is a memo Barr wrote last year blasting the Mueller investigation's focus on whether President Trump attempted to obstruct justice, in particular when he fired FBI Director James Comey. Some Democrats have pressed for Barr to recuse himself over that memo, as well as opinion pieces he wrote defending Comey's termination and pressing the Justice Department to further investigate Hillary Clinton. Democrats also want Barr to explain his view of presidential pardons, out of concern that Trump may move to pardon his former campaign chairman Paul Manafort or other associates caught in Mueller's investigation, the staffer said. But thus far, Democrats have not had an opportunity to interview Barr - and it is unclear if all of those who wish to will have the opportunity before his confirmation process begins in earnest next week. Sen. Dianne Feinstein of California, the Judiciary Committee's top Democrat, is scheduled to speak with Barr on Thursday, according to her spokeswoman. But other Democrats on the panel have complained that Barr is refusing to meet with them due to the ongoing government shutdown. Sen Richard Blumenthal, D-Conn., a member of the committee, said the administration cited the "truncated schedule" as the reason why Barr would not be available. An aide to another Democratic senator on the Judiciary Committee confirmed that the senator was similarly denied a meeting, with the administration citing the shutdown. "William Barr's refusal to meet with Democratic senators on the Judiciary Committee is entirely unprecedented and unacceptable," Blumenthal said in a statement. "The Department of Justice's attempt to excuse this gross break in the norms by citing a 'truncated schedule' is galling when they are the ones who have rushed it. My Republican colleagues should share my outrage at this appalling violation of the Senate's independent authority." Kerri Kupec, a DOJ spokeswoman, noted that Barr is meeting with both Democrats and Republicans "despite the holidays, reduced DOJ staff and resources due to the partial government shutdown, and the compressed timeline to prepare for the upcoming hearing." "He will continue to do so both before and after the hearing and looks forward to meeting with Senator Blumenthal and his colleagues," Kupec said. Meanwhile, Republicans on the panel are projecting an unflappable sense of calm as they plan out Barr's confirmation, which leaders hope to accomplish soon. Graham downplayed the Democrats' fears about whether Barr's stated opinions about the probe would cloud his judgment. "He's got some concerns about turning the firing of a political appointee into an obstruction-of-justice case, and I share those concerns," Graham told reporters. "But that's his opinion as a private citizen. As an attorney general, his job is to receive Mr. Mueller's report." He added that he intended to share Barr's memo and the full list of people with whom the nominee shared it with all Judiciary Committee members. Meanwhile in the House, the dawn of Barr's confirmation process is giving rise to tensions in the House Judiciary Committee, where Chairman Jerrold Nadler, D-N.Y., on Tuesday threatened to prepare a subpoena for acting attorney general Matthew G. Whitaker if he refuses to testify by Jan. 29. Democrats are concerned that Whitaker might have coordinated with Trump to restrict the reach of the Mueller probe, fears that were fomented after the acting attorney general decided to ignore the advice of Justice Department ethics officials to recuse himself from overseeing the investigation. But Republicans, led by ranking committee member Douglas Collins of Georgia, have argued that the focus on Whitaker is superfluous, because he is soon going to be replaced anyway. Collins said Wednesday that he was also "taken aback" by Nadler's subpoena threat, which he argued was currently impossible to even make good on. "I'm sorry, the chairman can't issue subpoenas right now when there's no committee that's been formed," Collins said, pointing out that the Judiciary Committee - like every other House committee - still lacks the rank-and-file members who would be needed to give the chairman the authority to subpoena in the first place. On Wednesday, Nadler sent Whitaker a letter asking him to appear by Jan. 29. Nadler earlier sent a letter to Whitaker in December, requesting his testimony. House Judiciary Committee Democrats consider that to be ample notice - and argue that if Whitaker does not agree to a January date, they will have the right to subpoena his testimony, with notice, as soon as Judiciary Committee members have been selected. Rank-and-file members are expected to be appointed to panels by next week. Collins also pushed back against Democrats' plans to ready a bill to protect the special counsel from being fired, by giving him swift recourse in the federal courts to appeal any termination order. "My question for the chairman would be: What's he need protecting for?" Collins said of Mueller, pointing out that neither Whitaker nor Barr had made moves or announced plans to limit Mueller. "Nobody has gone out of their way or even attempted to stop the investigation." The Washington Post's Tom Hamburger and Matt Zapotosky ontributed to this report. William Barr, the attorney general nominee, left, speaks with Sen. Lindsey Graham, R-S.C., at the Capitol on Wednesday, Jan. 9, 2019. MUST CREDIT: Bloomberg photo by Al Drago.